We may have called you with an offer to purchase the current edition of Canadian Who's Who. Did you ask me for money to list my biography? No. We never ask for money to list anyone's biography. The Who's Who name is old, and is sometimes used by other companies that may or may not be asking for money for fraudulent purposes. Please check the name of the organization that has asked you for money. If it is not Canadian Who's Who or Grey House Publishing Canada, it is not us. Can I have my biography in Canadian Who's Who? Maybe. Biographees in Canadian Who's Who are chosen on merit. Often people come to our attention for inclusion when they have won major awards from their business or arts community, or hold a high position in government, charity, commerce or another area of endeavour. We also try to include all those who have been awarded the Order of Canada, a provincial order, or a major research designation, such as a Fellowship in the Royal Society of Canada. If you should be included, or know someone who should be, we would be happy to hear from you. Please use the Nomination form available from the navigation bar above to send us the suggestion. Does Canadian Who's Who ever ask for money? 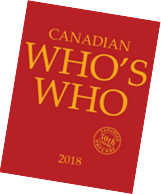 We sell the print edition of Canadian Who's Who, and subscriptions to the searchable Canadian Who's Who Online to primarily libraries and academic institutions around the world. If a biographee wants to purchase the book, we will sell it to them at a reduced price. Yes, we do phone, e-mail and face-to-face sales of this title. Who buys Canadian Who's Who? Libraries, researchers, and interested Canadians buy Canadian Who's Who, both online and in print, as a source of information about prominent individuals. It is often consulted before public occasions, when accurate biographical information is being sought, for example, for creating a guest list or for the introduction of a speaker. Inclusion of Canadians from every field of endeavour makes it a useful tool. The print edition is sold at a discounted rate to those whose biographies are included. Why are there more biographies in the online version than the print edition? There are approximately 14,000 more biographies in the online version because it includes biographies that were archived because the person is no longer active or is deceased. The print edition only lists the most current Top 10,000 living prominent Canadians. Where can I see the biographies in Canadian Who's Who for free? You can read print copies of Canadian Who's Who in the reference section of many libraries. If your library subscribes to Canadian Who's Who Online, you will be able to access the database through your library membership. I used People Search, and I couldn't find the person I was looking for. Why? Either the person you are searching is not listed with Canadian Who's Who, or his or her biography was not current in 1999, the year in which the database was digitized. Biographies that pre-date the conversion to a digital format can only be accessed through the print copies of back editions, or online through desLibris.ca. Do you have my grandfather's biography? What about my grandmother? Conscientious libraries have been purchasing Canadian Who's Who for years, and librarians should be able to show you the shelf where you can examine back editions. If you prefer, you may access online PDF editions of Canadian Who's Who by subscription at desLibris. Your library may also provide access through the Canadian Electronic Library.